Hyderabad is connected to other major cities like Delhi, Mumbai, Kolkata, Chennai, Bangalore by air, rail and road. A few international flights are also operating to and from Hyderabad Airport (Airport code HYD). You can find the geographical location and map of Hyderabad from the site www.mapsofindia.com. You can check the local weather from the site of Indian Meteorological Department. By Air: Indian airlines, East West airlines, Jet airways, Modiluft, Sahara Air, Vayudoot, Deccan, etc (and infact almost all domestic airlines) are operating flights to and from Hyderabad International Airport (HYD). A few international flights are also operating from Hyderabad. Please see the Andhra Pradesh Tourism Department's Travel Guide on How To Reach Hyderabad for a list of all major international airlines connecting to Hyderabad. By Rail: The easiest way is to reach Secunderabad, the twin-city of Hyderabad. All major trains stops or departs from here. Hyderabad is also a major point of arrival or departure. Another major station in the city is Kacheguda. By Road: The city is easily accessible by road since it lies at the intersection of two major national highways: NH 7 (Nizamabad Road, Medchal Road) and NH 9. University of Hyderabad is known as HCU and Central University also. The easiest way to reach the University from Airport is to catch a prepaid taxi. The new Hyderabad Airport is situated quite a distance from the University (and from the city also!). You can opt for a pre-paid taxi at the airport. The deal with such taxis is that you have to pay the fare in advance, once you provide an address of the university. You may have to tell that you want to go to University of Hyderabad (Hyderabad Central University or HCU), Gachibowli (Near to the Gachibowli International Stadium). Otherwise you can catch a bus from the airport to reach Medhipatnam and from there, catch an auto or taxi or again bus to the University. This is not going to be comfortable particularly if you carry some heavy luggage. 2) From Secunderabad railway station Platform 7A (OR Platform 10) or from Hyderabad railway station Platform 1A( also known as Nampally station) or from Kacheguda railway station take local electric trains known as MMTS train to Lingampally, which is the last station of this train. This is cheaper, and comfortable. Journey time is less than an hour. For train timings please check this link. 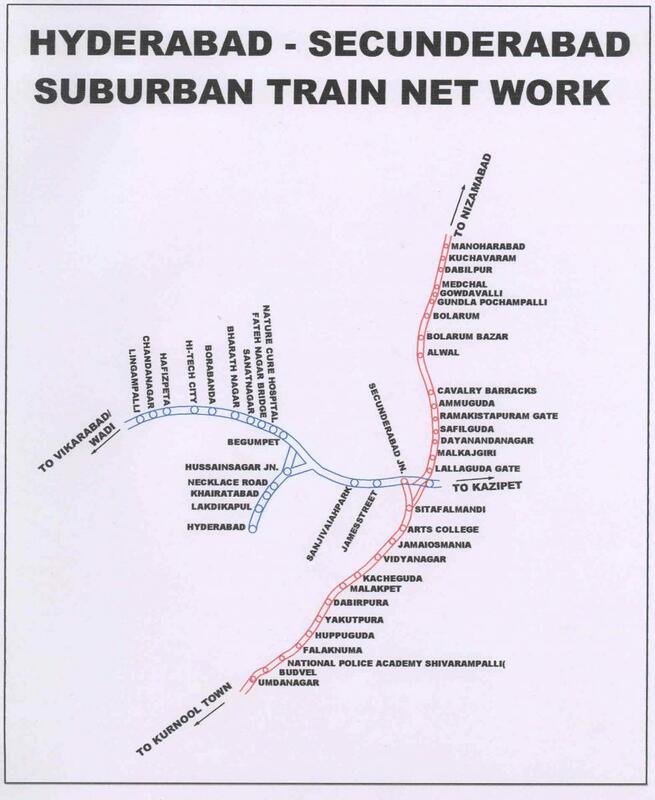 Also you can have a look at the local train network in this map. 3) From Secunderabad bus station which is at a distance of less than 150m from the Secunderabad railway station and it is in front of the railway station (if you get out from the 1st platform), catch a local bus either to Medhipatnam (bus number 5,49, etc. ) or to Lingampally (BHEL) (bus number 226). From Medhipatnam, catch any bus going towards Lingampally (for example, bus numbers 216, 217). The University has two gates but enter via the "main gate", so get down in front of the main gate. From Lingampally also, 216, 217 number buses (or any bus going towards Gachibowli) will take you to the main gate of the University. From Lingampally, HCU is about 5Km and autorickshaw will cost around Rs. 25-30. 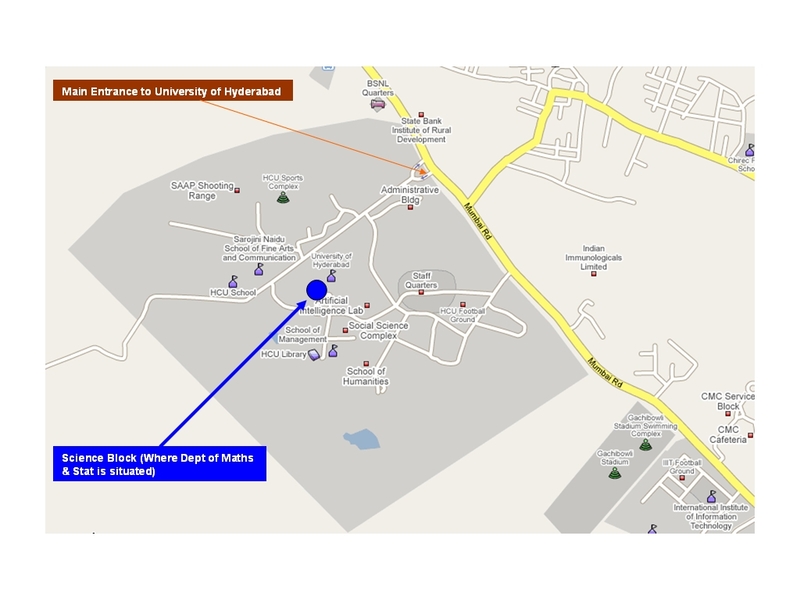 School is in the Science Complex in the campus and this map (Created using google map) will show you how to reach our school. So, have a nice journey!